Kleer English - An attempt at a reformed English Spelling. This project has had a name change from Nu English to KLEER ENGLISH in June 2012. Nu Links - useful references for development of Nu English. How Basic and other frequent words might look in Nu English. Completed Project -- all of the goals of the project have been completed and issued as a published book : -- September 14, 2012. ISBN : 978-1-300-16059-5 Printed by Lulu $18 + 4 shipping. Book is now available from Lulu.com in paper and eBook. And at Amazon.com in both book and Kindle editions. 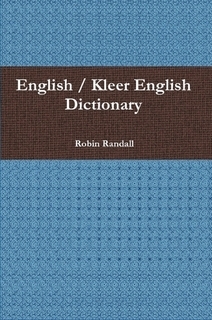 "This is a full English dictionary respelled in the Kleer spelling language as defined in this book. It is meant to provoke a discussion on the need to reform English spelling. It could also be used to teach students a simple form of English." Phase Two -- Kleer Grammar -- a simplification of English Grammar will begin soon. for the team now. Back to : Basic English Institute. About this Page : NewEnglish.html - Phonetic spelling rationalization of Basic Words for example in a new spelling, Kleer English. Last updated Sept 15, 2012 Announce book availability. October, Add Nu English 0.2. Add ITA, Add Dictionary. December -- the Basic 5000 pronouncing dictionary. April 8, 2012 Working on the book wording.